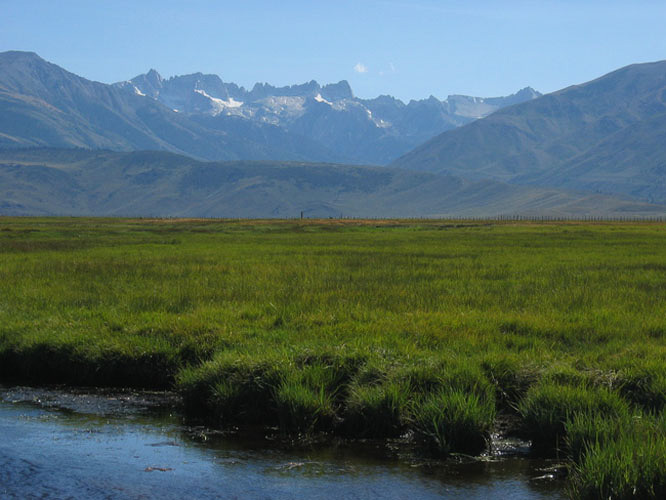 It was a clear sunny day when Dirk, Gordon, and I left our campsite at Mammoth and headed north to Bridgeport. We were still a little groggy from having been up late the night before. Dirk and Gordon had driven over last night from the Bay Area after work. I had just finished my final day of the 2004 Sierra Challenge, and Heyning Cheng was nice enough to drive me up from Big Pine to a diner in Bishop to wait for them. They arrived a little after midnight, and we went to sleep sometime around 2am. After securing the necessary camping permit (which was a first for me and Dirk), we headed to the Twin Lakes Resort. The rocky palisade of Sawtooth Ridge jutted up in stark contrast to the rolling foothills and flat fertile farmlands that we passed through on HWY 395. Dirk and Gordon had come here to climb the North Arete of Matterhorn Pk, and they had talked me into leaving the Sierra Challenge early to join them on the climb. From below we could barely make out Matterhorn Pk on the ridge – it didn’t stand out much from the ridge, but it looked impressive. After parking at the Twin Lakes boat launch and getting our gear in order, we strapped on our heavy packs and started up the trail as it switch backed up the steep open slopes below the mouth of Horse Creek Canyon. The trail was hot and dusty, but the views of Twin Lakes receding far below made the trail a nice hike. We set a fairly moderate pace, and although I was carrying a lot more weight than on the Sierra Challenge, the slower pace kept the hiking easy for me. As the trail passed the headwall to Horse Creek Canyon, it followed a short ways away from Horse Creek, occasionally shaded by old growth pines. At 8,200’ we reached a switchback on the main trail – from here it would be cross-country the rest of the way to our camp. The use-trail travel was nice at first as it passed through a clearing, but soon the going got tough. Thick bushes crowded in, covering the large boulders that the trail passed over. There seemed to be several trails one could take, and this just added to the confusion on where to go. The brush was slow going since the bushes made it hard to see where to step and the branches snagged our packs, but soon we were through the brush – now all that lay before us was a 1,200 ft climb straight up a loose talus slope. Dirk and Gordon slowed down as we reached the steep slope, but I sped on. My legs were built for powering up steep slopes, and since it was hot, sunny, and there was no good place to sit down, I just wanted to get the hill over with. After about 800 ft of climbing I found a flat spot with some sparse shade and dropped my pack to wait for the others. I saw Dirk and Gordon slowing up down below and hollered to them about finding a nice place for lunch. This seemed to give them the motivation to push on a bit longer and soon we were enjoying a nice lunch break as we enjoyed a wonderful view of Horse Creek Canyon. After lunch we continued on up the steep slope – luckily the ground was more solid at this point and there were more trees providing shade. Dirk and I stayed together as we picked our way through some cliff bands before heading up the final steep slope. We reached a saddle at 9,200 ft and were rewarded with a view of a beautifully green-blue alpine lake. 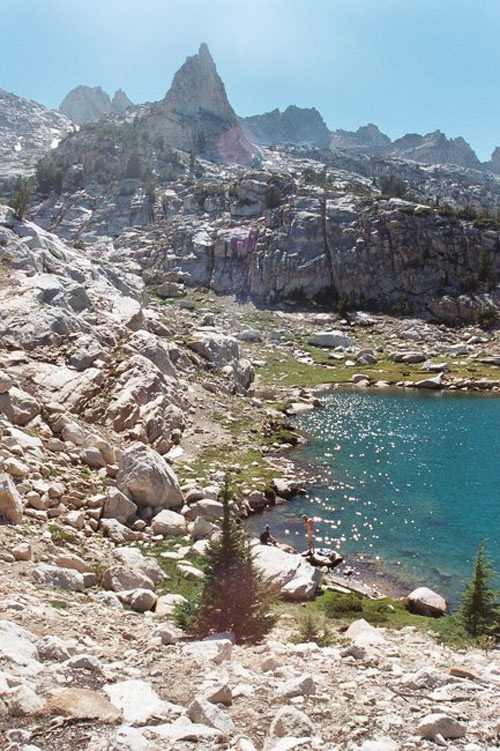 It was a few hundred feet across and surrounded by steep granite cliffs – the lake seemed to have bored down into the bedrock. There were some other hikers enjoying the lake below, and we left our packs to go join them. 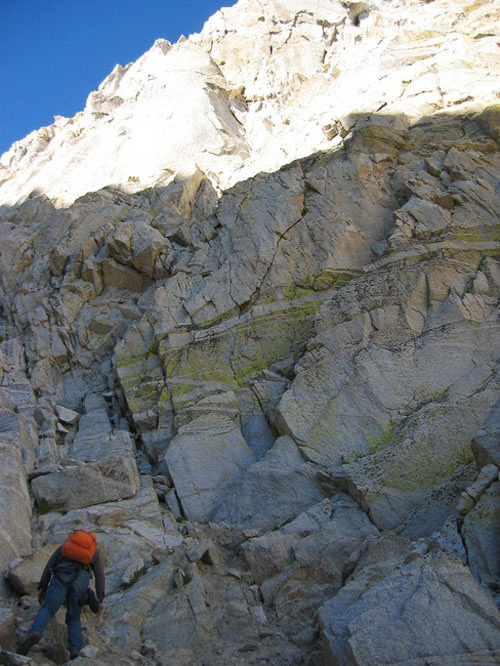 The hikers had climbed Matterhorn Pk via the East Couloir and were heading down that day. Across the lake was a tent and a pair of hermetic climbers who were intending on climbing the North Arete the next day (we talked with them once on the whole trip since they stayed in their tent the whole time!). Gordon happily plopped his pack down on the side of the lake just as Dirk and I decided to go for a swim. While we had been waiting for Gordon we tried to photograph a little frog in the lake and found the water to be warm enough for swimming. Dirk foiled my last attempt to photograph the frog as he dove into the lake. I stripped down and followed. I got used to the water fast, but my feet froze when I let them dangle too far down. We tried to coax Gordon into going for a swim, but he declined, content to just relax and enjoy the view. There was a large flat grassy spot atop a ledge on the south side of the lake, but the open meadow to the west was more inviting, so after our swim, we set up camp on the other side of a large boulder about 100 ft away from the other climbers. While I got my tent set up and gear organized, Dirk took off to try some bouldering traverses above the lake. He called insisted that Gordon and I try the traverse, but both of us were feeling rather lazy by then and just relaxed around camp, enjoying our full view of Matterhorn Pk further up the canyon. 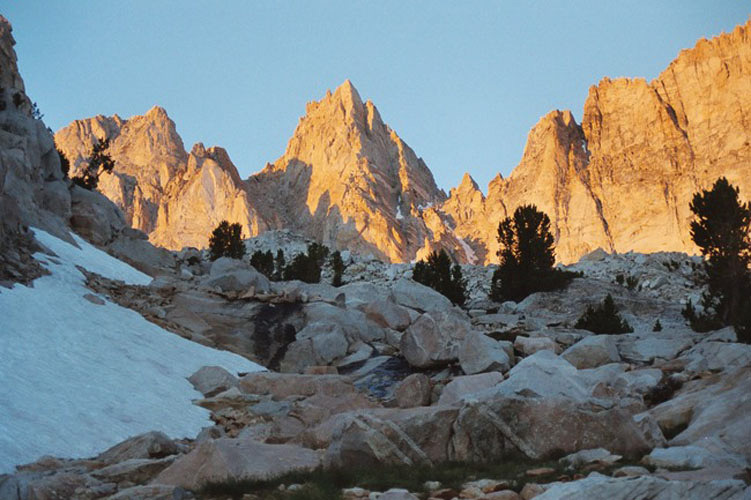 This was one of the best campsites I had been to in the Sierras, and although the approach was quite trying, it was well worth it to get here. Dirk explored the cliffs to the west of our camp, climbing up a large chimney and disappearing over the horizon to catch the sunset. We woke up before sunrise and headed up the grassy ledges that rose like steps heading south from the lake. The cross-country travel was easy and we were making good time. 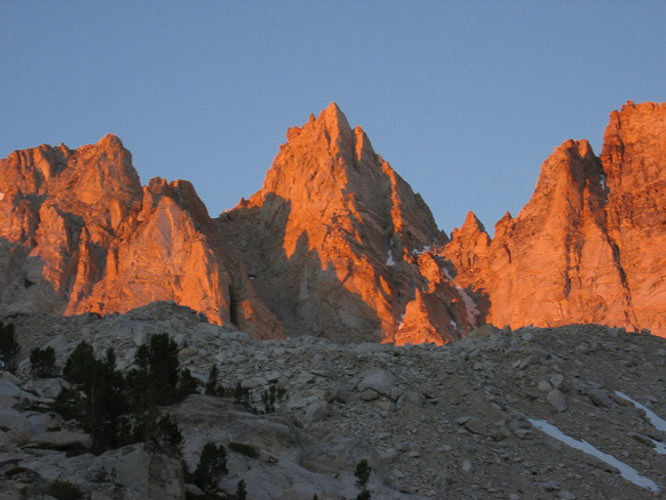 Soon the sun rose, and we were awestruck as the alpenglow lit up Matterhon Pk above us like a pillar of fire. Dirk had commented earlier that the peak looked more like a rocket at liftoff than resembling Matterhorn, and when bathed in the hot red glow of the morning sun, it looked even more like a spaceship lifting off. Soon we were at the loose glacial moraine, and we climbed over a thin part of it on the southeast side of the glacier. As we were putting on our crampons we noticed our campsite companions traversing around the north side of the glacier. The other climbers had woken before us and had gotten about a half-hour head start, but it seemed like now they were wasting a lot of time trying to stay off the glacier and traverse around the steep loose slopes above. The trailing climber consistently sent rockfall down the slope while her friend coached her on. He had reached some solid cliffs at the head of the glacier, but despite efforts to stay off the glacier, he still had to cross it high up to reach the East Couloir. We commented on the absurdity of their route and then headed straight up the glacier. Gordon Ye at the base of the route. The glacier was heavily sun cupped, making the walking hard at first, but then easier as the slope increased. I headed up and to the right, staying on the glacier as long as I could before transitioning back to rock. Dirk and Gordon stopped to admire a crevasse and then picked their way to a ridge of loose rock to the left. I had just reached the top of the glacier and was setting my pack down on a well-protected ledge when Dirk called out to me to come down and join them where they were taking off their crampons. “Hell no!” I shouted back – I didn’t want to give up my hard earned elevation only to regain it with them. They would have to pass by me anyway, so I insisted on waiting for them were I was. Once they reached me we cached our axes, crampons, and extra water on a ledge, but hid it out of site lest a climber higher up thought that our gear was a fallen body. Dirk had been keeping a close eye on the features of the route as we had approached the peak, and he led us a few hundred yards up the East Couloir before finding the start of the North Arete route. The two other climbers were already on it and their shouts echoed off of the rock walls. Luckily Gordon had brought some radios along to save us from such awkward communication. Earlier on we had discussed climbing as high up the route as we felt comfortable before roping up in order to save time, so Dirk headed straight up a steep chimney to reach the first set of ledges. Gordon and I traversed a bit higher to where the climbing was a little easier. Neither of us traversed far along the ridge before the exposure had us calling Dirk back to begin roped climbing. I gave Gordon the rope as Dirk set up and anchor and climbed back to us. He belayed Gordon first and then brought the rope back to me. The beginning climbing was very easy and there were portions were we climbed unroped. Soon we reached a large notch as we gained the ridge proper, and the real climbing began. Since there were three of us climbing, this required a bit more rope-handling and communication, and Dirk had figured out a nice way to get three climbers up the route. Besides having the radios for communication, we also had a 60m long 5mm thick cord. The idea was that the second would tie this to his harness and trail it behind. Once at the next belay station, the second would tie the climbing rope to the cord and the third could pull the end of the climbing rope back down to tie in to. Luckily we didn’t have to fiddle with this system too much because the climbing wound around so many obstacles and there were enough good ledges that rope drag encouraged us to climb in half-pitches. I had distances marked out on my rope, so we let Dirk know on the radio when he would need to set up an anchor. Gordon would tie into the middle of the rope and re-clip the rope as he passed pro. Then I followed and cleaned up the pitch. Dirk leading the fun 5.6/5.7 dihedral and crack pitch. From the notch Dirk led up and right, onto the west side of the Arete. On the next pitch Dirk headed back up to gain the ridge. 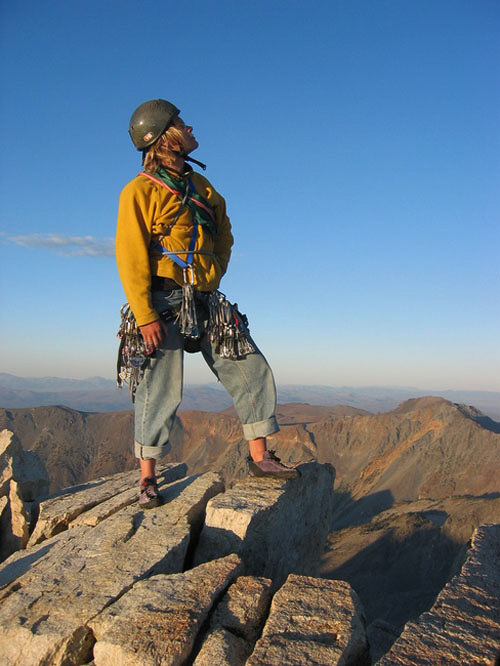 He had to go further than half the rope length in order to reach the next good belay station. After Gordon followed I had to break down the anchor and climb a ways to give Gordon enough rope to reach the belay. Luckily the terrain was sheltered, so it was safe to climb on. I reached a blank vertical wall with a large crack heading straight up the middle, and I had to climb up about 3 or 4 feet to give Gordon the final distance he needed. After going on belay, I continued up the crack. It was very steep and it was easy to get good hand jams. I didn’t have to climb high above the ledge before it felt very exposed – the terrain dropped away very steeply all around me. After climbing in the relative protection of the jumbled and rocky ridge, the sudden exposure felt exhilarating. After climbing about 20 ft of crack I reached the top. Dirk and Gordon were waiting for me just above where the crack turned to face climbing. The belay spot was not very good. The anchor was built across a small dihedral, with pro on some cracks on the far side, in the corner, and on the near side. 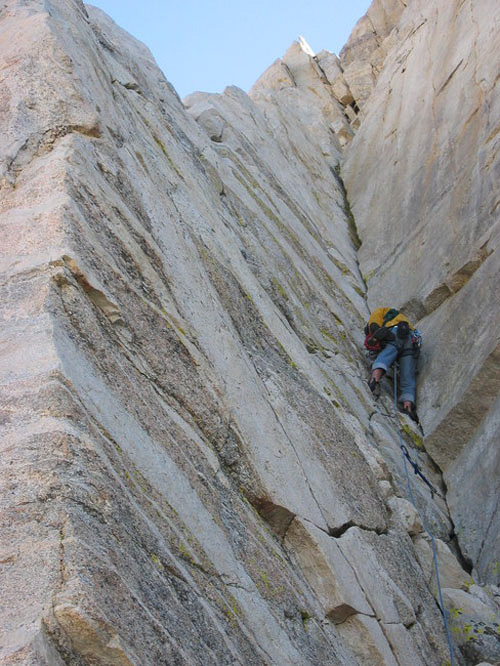 The dihedral was canted back at about 70 degrees, and Dirk was belaying by stemming across the dihedral, utilizing a diagonal crack on the right face for a foothold. Gordon had to climb past him and was clinging to the other side. There was no room for me in the dihedral, so I straddled the outside corner and tied in to the anchor. The belay setup became more worrisome when Dirk tried to get a better cam in on the far side of the dihedral. As he was fumbling with the cams he dropped something metallic – it fell, bounced once over the edge and out of site, and then no more. Dirk was pissed – he had dropped a cam! I felt a little more relieved upon hearing his cursing about the loss, since I was worried that he had dropped the whole carabiner of cams. Dirk led up the pitch and stopped after climbing only about 50 ft. He had found a much nicer belay station and declared that it was worth the time to set it up for a more comfortable belay. Then he noticed that his ATC belay device was missing. During the confusion of handling the gear spanning the dihedral he must have dropped it! I looked around and saw that it was wedged in the corner, about 10 feet below me and about 2 feet from the horizon where the steep dihedral terminated at a steeper cliff. I radioed to Dirk that I had found his belay device and would down climb to retrieve it after Gordon had gone up. In the meantime Dirk fashioned a belay using a Munter Hitch for Gordon. Just after Gordon cleared the dihedral I heard a shout: “ROCK!” Suddenly a rock about 18 inches across ricocheted down the dihedral. Luckily I was straddling the outside of the chute and was out of harms way, but I was briefly startled as I thought that the rock might smash into the anchor spanning the dihedral, pulling me off of my perch. Then I was on belay and climbing down to the ATC. I clipped it on to my harness and radioed to Dirk to belay me climbing up. “Any chance that you can climb down and get my cam?” he queried. I looked over the edge and saw nothing but space all the way down to the East Couloir. After I reached Dirk and Gordon we dismantled the belay station since the ledge was large enough to be safe on unroped. We were one pitche away from the top, and at this point the route had two variations: The humongous 5.6 dihedral that is a noticeable part of the left side of the top of the north face; or finishing via the 5.7 direct arête. Dirk wanted to do the arête, but Gordon and I lamely excused ourselves as being too tired to do a harder route than was necessary. Because of my participation in the Sierra Challenge, and my fast hiking pace that I led with on this trip, Dirk didn’t believe me for a second. In truth I was a little tired from the stressful position of the last belay, and the exposure had also been a little psychologically tiring to me. Also, I really wanted to climb the final dihedral since it looked like a lot of fun. The final pitch had to be done as a full pitch – the first half pitch ascended a crack that was formed by the corner of the massive dihedral. The walls were smooth and the crack varied from less than finger-width to off-width. Above that was a short ledge and then a 20 ft off-width chimney. I belayed Dirk as he climbed up the crack. It looked like a blast and I was anxious to try it. This time I seconded, trailing the thin cord beneath me. The final pitch was every bit as fun and interesting as I had hoped. There were few places where I was able to solely jam in the crack. Usually I was in some combination of a hand and foot jamb, a foot smear, and a hand holding onto a small nub on the side, mostly for balance. Dirk had left his pack at the off-width chimney to avoid getting it stuck, and he lowered a portion of the rope back down to me to tie onto our packs. He hauled them up and then I followed. Then we tied the climbing rope to the cord and Gordon easily retrieved the end of the climbing rope. The top was rather anti-climatic. 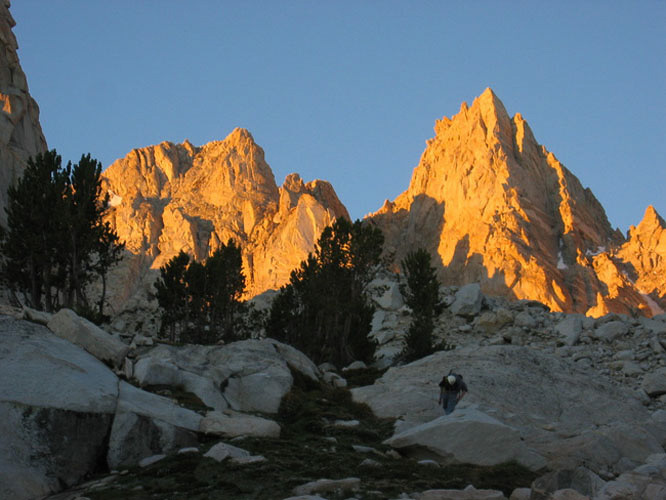 From the photo in Secor’s guidebook it appeared as if the route terminated on a very fine pointy summit. In reality the summit was still out of site, another 200 ft away across some class 4 climbing. To save time Dirk wanted to free-solo the class 4. I looked at the exposure on both sides of the ridge and decided that I’d rather not risk falling off of the north face. Just at this time we heard another climber heading up from below. He topped out, but without a rope! He casually declared that he was in his office in Lee Vining that morning and had decided to go for a climb, so he drove up to Twin Lakes, hiked up Horse Creek Canyon, and free-soloed the entire route, just finishing when we were. He seemed a little cocky, and just like another climber Dirk and I had encountered on the West Ridge of Mt Conness a year earlier, and Dirk was likewise irritated this time as he had been before. I found the situation a little comical. Dirk had tried unsuccessfully to talk Gordon and me into free-soloing the last part, and now we asked this other climber to report back to us as to what the remainder of the ridge was like. He climbed on and reported that the climbing was easy – just don’t fall. Gordon and I won out with our desire to rope up for the last part, so Dirk sent me off on lead. 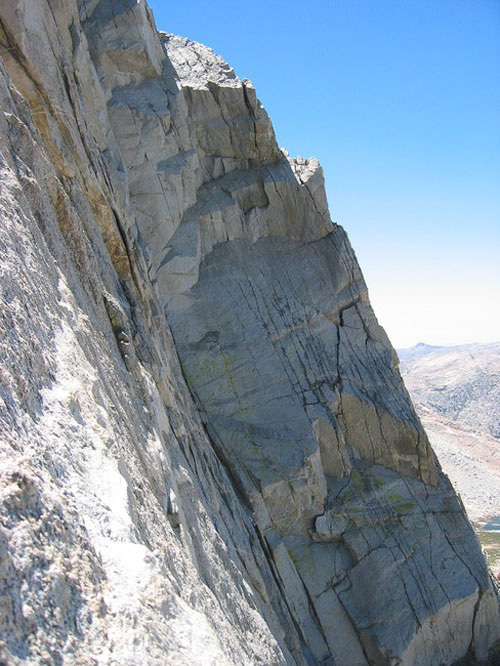 A scrambled along a ledge with an awkward overhang above it on the left side of the ridge, over some loose rock, and then back up and over the other side of the ridge. By then there was a lot of rope drag, so I set up a light anchor and belayed Gordon over. Dirk decided that he might as well use the belay since it was there, and followed. Dirk led the next pitch, this time up some very sharp knife-edges, and soon we were on the summit. After a short celebration and some posing on the summit we picked up and moved on. The plan had been to get down to the car today, and the sun was already setting! I was having flashbacks to all of my previous climbs with Dirk. 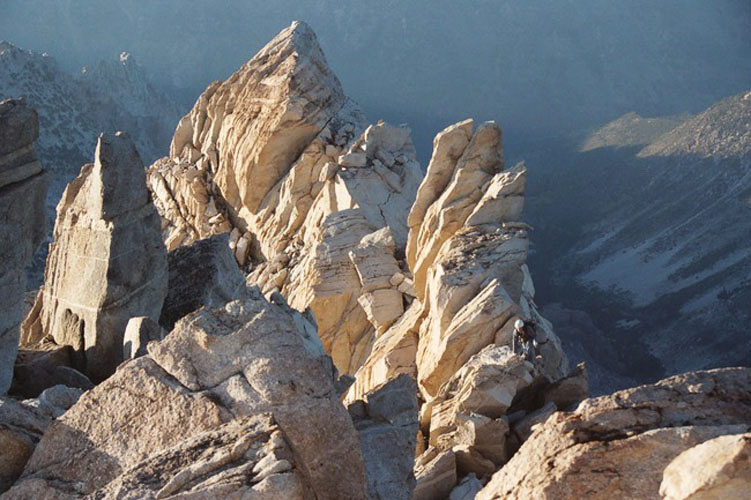 Mt Conness, Mt Sill, North Palisade – they all had one repeated theme in our alpine adventures. We would get caught out in the dark and be forced to bivy! Gordon mentioned that he had never had to bivouac in the mountains yet, so we joked that maybe his good fortune would change the outcome of this trip. Hopefully this time would be different. We turned on our headlamps just as we reached the top of the East Couloir. Without snow cover it was quite the ‘poop’ chute. The rock was very loose. We were amazed to be back down at our cache within about 40 minutes – the climb had taken HOURS! We strapped on our crampons and quickly headed down the glacier, climbed over the moraine, and continued down the ridge. Then the trouble started. We were not on the same ridge we had come up. The terrain looked unfamiliar and it seemed like we were on a ridge that we couldn’t match up on the topo. I tried to keep in mind the phenomenon of the terrain seeming larger and having higher relief in the dark than in daylight, so I wasn’t too worried. We occasionally stopped to debate about which way to go. Once we got low enough to hear the creek I knew that we were all right. There was only one stream in the area, feeding from the glacier into the lake by our camp. We were descending below the ridge we had climbed that morning, but if we dropped down to the more level canyon bottom we would be back in no time. The stream kept us on track and soon we were back at camp. We thanked Gordon for his good karma and then took stock of our situation. It was now around midnight and we were exhausted. Hiking out in the dark would be very unpleasant, and it would probably be so slow that we wouldn’t reach the trailhead until sunrise. Since Gordon had cell phone reception, he and Dirk called in sick for work and we went to bed. We woke up at sunrise and had a nice hike out. Heading downhill was very easy and soon we were back to the bushwhacking in Horse Creek Canyon. We were back down to the car by noon. After stopping for lunch in Bridgeport we began the long drive home. The past two weeks had been very trying for me physically, but I had persevered. I had flown out to California, climbed 7 peaks and around 33,000 vertical feet in the Sierra Challenge, and then headed straight out to climb Matterhorn Pk. 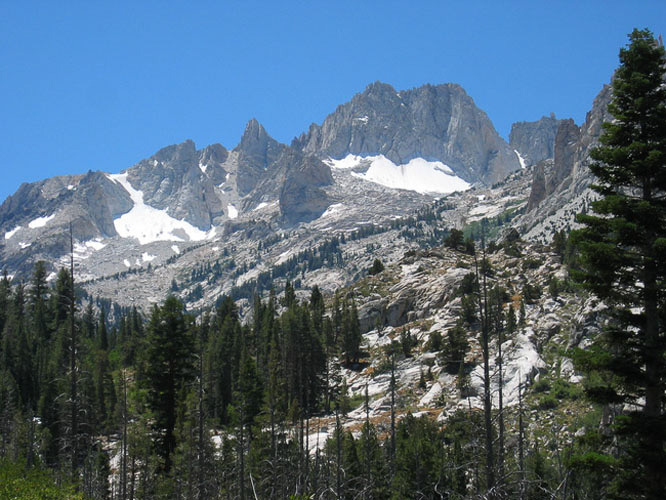 Quite the 10-day excursion to the High Sierra! I had had a great time and I vowed to come back to the Sierras for the next Sierra Challenge, and next time I would make sure to be in even better shape.